Lord Shiva is one of the most important deities in the Hindu religion. 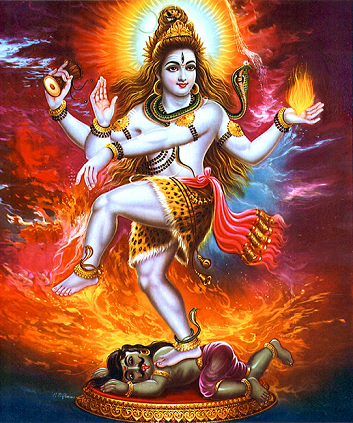 He is known by many names including Mahadeva, Rudra, Shambhu and Nataraja. 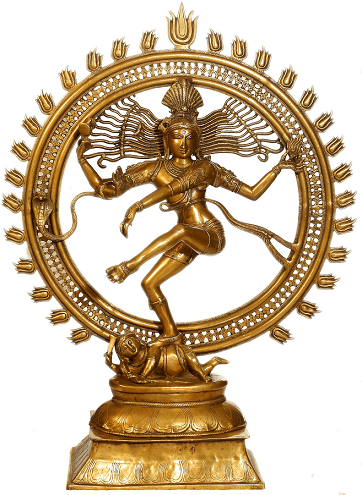 Shiva’s form of Nataraja symbolizes the cosmic dance of creation and destruction, according to an article by Aayush on detacher.com. Lord Shiva is one of three primary deities of the Hindu trinity and is worshiped as both the destroyer and the transformer of the world. He is the source of art, religion and science. “In God’s endless dance of creation, preservation, destruction, and paired graces is hidden a deep understanding of our universe. Nataraja’s dance is not just a symbol, it is phenomenon taking place within each of us, at the atomic level, this very moment,” Aayush wrote. The dance exists in five forms depicting the cosmic cycle from creation to destruction. It is believed that Lord Shiva danced the universe into existence, motivates it and will eventually end it. The dance has the rhythm of divine perfection as a subtle vibration. It manifests in the cyclical nature of the seasons, planetary movement, scientific laws and the body’s biorhythms. Sometimes, rather than the flame, he holds a trisula – a three-pronged sacred weapon. Every detail – including Lord Shiva’s unkept hair and the ring of fire – have significance. He is unconventional, making and breaking moral codes and social customs to demonstrate his freedom. His abode is Mount Kailash in the Tibetan Himalayas, which is considered sacred in four religions: Bon, Buddhism, Hinduism and Jainism. Nandi, usually depicted as a bull, is the guardian of the gate to Kailash and the vehicle for the Shiva. The Goddess Parvati or Shakti is Shiva’s consort. His divine sons Ganesha and Kartikeya occupy important places in the Hindu pantheon. He is pure in heart and easy to please, a good husband and father. There are two fundamental approaches to worshiping Lord Shiva: the right hand method and the left hand method. In the first, Shiva is worshipped in the traditional manner with prayers, chants, offerings of flower, water, light, incense, honey, milk, sandal paste, saffron, clothing and food, according to Jayaram V’s article, “The Worship of Lord Shiva” on hinduwebsite.com. “The left hand methods of worship are extreme in nature and followed only by a very limited number of followers in tantric traditions of Saivism. Some of them are extremely disgusting and generally despised by the public,” he wrote. In India, celebrations and austere practices such as fasting and praying daily are held from July to August to worship Lord Shiva. Saivism, however, considers devotional worship and services secondary to the more superior methods involving knowledge, yoga and meditation. Remember to remove old offerings when presenting new ones, and keep the shrine or altar area simple and free of clutter that would block energy. Worshipers are cautioned it is bad luck to offer coconut water, turmeric and Ketaki flowers to Lord Shiva. Shiva is powerful. He destroys what was to create what is. He helps us move beyond our attachments. He destroys suffering and removes impurities such as ignorance, egoism, delusion and pride from us to facilitate our spiritual growth. That makes him the right deity to worship if you are looking for a change of direction in your life. He protects all animals from disease, death and destruction. All knowledge flows from Shiva, especially liberating knowledge in the form of Ganga. ists and scientists both can turn to him. ians, too, as he was a good musician, singer and dancer. Akhilanda is the Hindu Goddess of Never Not Broken. Her formal name is Akhilandeswari Ma, and is known informally as Khodiyar Ma, a form of the Great Mother Goddess. In Sanskrit, Akhilanda means “never not broken” and Ishwari is Goddess or female power. She is one of India’s oldest depictions of the Goddess. She is said to be originally a Vedic Goddess, the Vedas being the oldest layer of Sanskrit scripture. She is also known as the Goddess of the “agamas”, the texts known as tantra. She has been described as a form of the Goddess Parvati and as associated with Goddess Durga. She carries a trident and stands upon a crocodile upon a rushing river. She moves and allows herself to be moved by the motion of the crocodile upon the rushing waters of the river. She surrenders herself to the movement. Her power comes from being pulled apart and coming back together again; always broken, so she can never BE broken. She is destroyed (broken) and created/re-created again and again. Akhilanda represents where we are broken, our pieces instead of our whole. The crocodile is our fears, our vulnerabilities. She teaches us that our power is in our pain and that we have the strength and ability to pull ourselves back together, again and again, after breaking. We re-create and rebuild ourselves over and over into whom we wish to be. Akhilandra is there to help us transition from one place to another after we are hurt, when we feel sadness, when we have suffered loss. She assists us to grow, to transform, to heal and mend those broken bits and pieces. Just as she surrenders to the motion of the crocodile and the waters of the river, so we should surrender to whatever we are feeling, trusting that we will once again be whole. Vishnu (pronounced Vish-nuu) is one of the principal deities of Hinduism. He is one of the Hindu trinity along with Brahma and Shiva. Brahma is the creator of the universe; Vishnu is the preserver, protector and keeper of the universe; Shiva is the destroyer. It is said that during troubled times when the world is threatened by evil and chaos, Vishnu returns to restore righteousness. So far, he has reincarnated nine times: Matsya (fish), Kurma (tortoise), Varaha (boar), Narasimha (half lion, half man), Vamana (dwarf sage with the ability to grow), Parasurama (fierce man/hunter), Rama (greatest warrior/perfect man), Krishna (mentally advanced man) and Balarama (Lord Buddha). Each incarnation Vishnu’s avatar – as a person, an animal or a combination of both – was what was most needed at the time. Myths, legends and stories are associated with each. He rids the earth of irreligious and sinful monarchs, kills a demon, raised the earth up out of the sea, sent a ship to save a sage and his collection of animals from a giant flood so they could repopulate the earth, and held a mountain on his back for 1,000 years while the gods and the demons used a serpent to churn up the ocean of milk to create the nectar of eternal life. It is believed Vishnu will come one more time as Kalki (eternity or mighty warrior) near the end of the present age of decline in which we are currently living, a time thought to be near the end of this world. He will come – riding a white horse and carrying a fiery sword – to rid the world of oppression by unrighteous rulers and heralding the start of a new golden age. Vishnu is portrayed with a human body, often with blue skin, and four arms. In his hands he carries four objects representing the things for which he is responsible. The conch shell in his upper left hand produces Om, the primeval sound of creation. His blows call beings of conscienceless to listen to their inner voice nudging them to seek the truth, and leave the darkness of a material life for a higher reality. In his upper right hand is the chakra or discus, symbolizing awareness and the universal mind. Called Sudarshan, the disc shows the path to a higher awareness. It destroys ignorance. A lotus flower in his lower left hand represents a glorious existence and liberation. The mace, a symbol of mental and physical strength and cosmic knowledge, is held in his lower right hand. It is called Kaumodaki, meaning that which captivates the mind, and is associated with time, which is the destroyer of all things; thus it also related to Kali. When pictured as a deity, it is viewed as a female with two hands, held together in a position of prayer or respect. The garland of victory Vishnu wears has five rows of flowers that represent the five senses and his mastery of them in the whole universe. The god is typically seen in two positions. The first is with him standing on a lotus flower with his consort, Lakshmi, close by. He is also portrayed reclining on a serpent, surrounded by the Milky Ocean with Lakshmi massaging his feet. Vishnu rides on the king of birds, Garuda, an eagle. He is particularly associated with light and especially with the Sun. “Vishnu is identical to the formless metaphysical concept called Brahman, the supreme, the Svayam Bhagavan, who takes various avatars as ‘the preserver, protector’ whenever the world is threatened with evil, chaos, and destructive forces,” according to Wikipedia. He is said to expand into everything, permeating all objects and life forms. He maintains the cosmos and he overcomes all. Vishnu represents the goodness that sustains everything, giving shelter and a place to rest, and reaching that is the goal of all living creatures. Because he cares for all life on earth, worshiping him – as himself or any of his avatars – helps with protection, prosperity and wisdom. His birthday, typically in late August, is Krishna Janmashtami, the largest Vishnu holiday. Krishna “accepts any offering given in devotion to him, whether it be a leaf, a flower, or a single drop of water. He cares more about the intention of a prayer than getting it ‘right,’” Choate wrote. A ritual presented in the article for invisible protection against enemies or evil instructs that it be done on a Friday night after 11 p.m. and repeated the next 10 nights while remaining celibate the whole time. Offer the yantra white flowers, grains of rice, incense and a ghee lamp. People whose Moon and Venus are strong will be attracted to Krishna. People whose Jupiter is strong will be attracted to Ram. The article instructs you to pray only after taking shower and cleaning your teeth. Your clothes should ideally be yellow and clean. Always apply a tilak (a mark worn by a Hindu on the forehead) of yellow sandalwood or a mixture of turmeric and sandalwood. Don’t touch or be near the Vishnu idol when you’re angry, have ego, are greedy, or full of lust. To get a wallpaper of Vishnu, visit http://www.bhmpics.com/lord_vishnu-desktop-wallpapers.html. It might provide some mood music, or frame your own practice to honor Vishnu. My thought was to listen to it while envisioning myself safe in the center of this Sudarshan Yantra. This Goddess makes me so very happy. Finding her started last Yule when my husband gave me a statue of Ganesha. I was surprised because my spirituality is Goddess-based only. I placed him amongst my Hindu Goddesses. A couple of months later, looking at Him, it occurred to me that there just HAD to be an elephant-headed Hindu Goddess. Frantic research ensued, and voila……I give you Vinayaki. Little is found in Hindu scriptures about Vinayaki and just a few images exist of Her. She is most generally associated, of course, with Ganesha and is assumed to be his Shakti. She is also said to be the 5th of Ganesha’s 32 forms. In this form, She would be the protector of the householder, vanquishing evil and bringing peace to the home. She is known by various names, such as Sri Ganesha, meaning female Ganesha; Vainayaki; Gajanana, meaning elephant faced; Vighneshvari, meaning Mistress of Obstacles and, in Tibet, Ganeshani. She is very often seen as part of the 64 Yoginis. The 64 Yoginis was a cult of mystical, female dakinis, now usually called yoginis, between the 9th-13th centuries. It is thought that their worship was a blending of Shaktism and Tantric. A yogini is used to refer to the forms of Devi, the Great, Supreme Goddess, and/or different parts of Her body. A dakini is most often thought to be a messenger or attendant to Devi. Devotees of Devi were also called Shaktas. There are believed to be nine 64 Yoginis Temples located in India. At the 64 Yoginis Temple in Chausath, She is the 41st of the 64 Yoginis and is named here as Sri Aingini. She is slender, with full breasts. She is also depicted in Chitrapur Math Shirali, holding a sword and a noose. In Satna, there is an image of five Goddesses, one of which is the cow-headed Vrishabha, who is holding the infant, Ganesha. Vinayaki is portrayed holding an elephant goad, or bullhook, much like the adult Ganesha. This could indicate that Vinayaki and Ganesha are siblings. One myth tells us that the demon Andhaka wanted the Goddess Parvati for his wife. Shiva fought Andhaka, but each drop of his blood made another demon. Parvati called on all of the Shaktis, which included Vinayaki, to drink the demon’s blood before it hit the ground and Andhaka was destroyed. At this time, Vinayaki became a handmaiden to Parvati. Some see Her as part of the Matrika or Divine Mother Goddesses, a group of Hindu Goddesses always depicted together, which may or may not be the same group of Shaktis called upon by Parvati in the above story. In this stone tableau of the Matrikas, you can see Vinayaki on the far right. The fourth day after a new moon is called Vinayaki Chaturi. Even though this day is sacred to Ganesha, it is named after Vinayaki. In Buddhist traditions, She is an independent Goddess and is called Ganapatihrdaya, which means “heart of Ganesh”. Whatever Vinayaki may be – Yogini, Dakini, Matrika, or independent Goddess, She is more than welcome into the pantheon of Hindu deities. Since I began writing girl talk the thing I’ve enjoyed the most has been researching different information to include, with Lakshmi, the amount was overwhelming and incredibly interesting. Lakshmi was born , fully-grown, on a pink lotus that rose from the sea. She appeared bearing gifts and was so strikingly beautiful that all of the Gods wanted her as their wife. She chose to be with the sun god, Vishnu, and it is said that she was thereafter reborn to remain his companion in each of his lives. In addition to wanting Lakshmi as a wife, she was also immediately given offerings, and jewels and the gods and sages prayed for her to come to their homes, and worlds, because it was believed that where Lakshmi is you will find riches and fulfillment. Lakshmi’s name is derived from the Sanskrit word Laksya, I also found it spelled as Laksme, but the translation meaning goal or aim is the same for either spelling. In researching her I also found that there are 108 other names she is also known by and on her holy days all 108 names are recited to honor her. The four arms represent the four directions in space and symbolize the omnipresence and omnipotence of the Goddess. The color red symbolizes activity. The golden lining, or embroidery, represent prosperity. This is meant to convey that she is always busy distributing wealth and prosperity to her devotees. The lotus upon which she sits or stands, signifies that while living in this world, one should enjoy its wealth, but not become obsessed by it. To live this way is like a lotus that grows in the water, but is never wetted by it. The four hands represent the four ends of human life: dharma (righteousness), kama (genuine desires), artha (wealth), and moksha (liberation from birth and death). The front hands represent the activity in the physical world and the back hands indicate the spiritual activities that lead to spiritual perfection. A lotus in the back right hand conveys the idea that one must perform all duties in the world in accordance with dharma, which leads to moksha, or liberation, symbolized by the lotus in the rear left hand. The golden coins from the front left hand shows she provides wealth and prosperity to her devotees and the front right is bestowing blessings. With regard to the number of elephants pictured, two symbolize the name and fame associated with wealth although the idea is that one should not require wealth merely to acquire name and fame, or for material reasons it should be shared with others in order to bring happiness to them as well as himself. When there are four elephants spraying water from golden vessels onto Lakshmi, the four elephants again represent the four ends of human life. The spraying water indicates activity and the golden vessels indicate wisdom and purity. The message it is meant to convey is that with continuous self effort in accordance with dharma, and governed by wisdom and purity, leads to material and spiritual prosperity. Another interesting finding is that Lakshmi and Ganesh are cohorts, who often work together. Ganesh is known as a remover of obstacles so ideally one would invoke them together, Ganesh to clear the path for Lakshmi to assist. Although he is not her mate, Ganesh adores Lakshmi, and is always happy to assist her. It is believed if a person honors Lakshmi daily you can develop a channel of communication with her. I also found reference made to the fact that she loves singing, chanting, bells and so on. In India there are multiple holidays devoted to Lakshmi. The special annual day of worship for her is known as Diwali which is marked with religious rituals, as well as colorful ceremonies dedicated to her. Friday is the best day to work with Lakshmi. Unlike other Goddesses that have items associated with them, or that represent them, my research found that for Lakshmi there are offerings which are given, among these are fruit, flowers, any type of sweets, money, yogurt and honey. Sandalwood incense is also used. In spite of her association with elephants her animal representation is the owl. 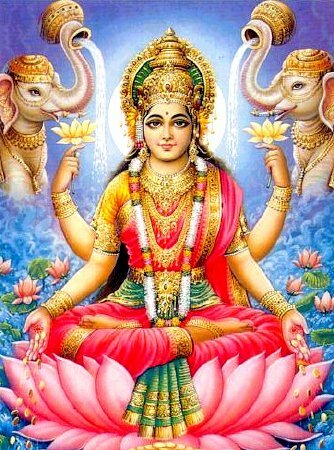 When a request of prosperity or abundance is made of Lakshmi, it is her way to not only provide abundance or prosperity of material things, but provide them in a way that brings abundance to the soul as well. She is also most helpful to work with in bringing improvement or enlightenment to ones spirit as well. If you are interested in learning more about Lakshmi the amount of information that can be found about her is truly amazing, there are so many more things that I found interesting they could never be contained in a format of this type. Let it just be said that where abundance, prosperity and beauty are needed the sweet natured Lakshmi will surely answer. Give her thanks, and hold her dear and she will not leave you in need.